Ben Faulding (L) with the headphones that he was wearing during the encounter with the police (R). 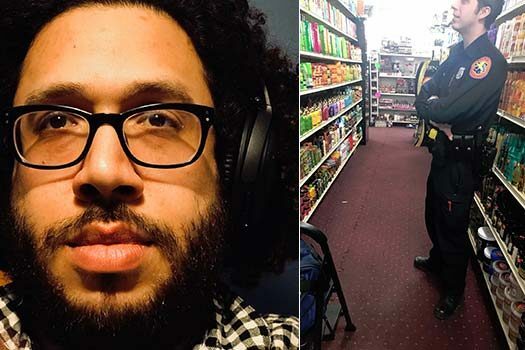 Imagine walking into a convenience store with your headphones on, picking out a conditioner bottle — then turning around to see two police officers pointing their guns at you. That’s what happened to Ben Faulding, a black Jewish New Yorker who goes by @TheHipsterRebbe on Twitter and Instagram. In a tweet thread Wednesday, he narrated his shock when, on a walk back from his gym in Long Island, New York, he stopped to buy some toiletries. Faulding writes that he found himself facing two police officers with their guns pointed at him, screaming at him to get on the ground. Faulding feared for his life — and had trouble hearing the cop because he was wearing noise-canceling headphones. The experience made Faulding think of Daniel Shaver, an Arizona man who was shot and killed recently by police while he was following their instructions — but had reached back to pull up his shorts. The officer who shot Shaver said he thought Shaver was reaching for a gun. Faulding followed the police officers’ orders, and they handcuffed him and removed his headphones. After searching his bag and finding nothing, they let him go. The thread has gone viral, getting retweeted more than 100,000 times as of Friday afternoon. Faulding has written that he regularly faces racism from Jews. 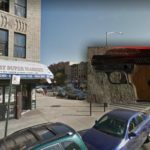 In a blog post from 2014, he wrote that while living in Crown Heights, a Brooklyn neighborhood with a large Jewish population, people would call him “shvartze,” a Yiddish term used to disparage black people. To protest the term, he posed for a photo with the slur written on his forehead. But despite facing racism — along with anti-Semitism — Faulding wrote in 2014 that he doesn’t want to be defined solely by his race or religion. this guy needs to find another cause. literally no one would pick him out as black from just walking by him on the street. We only know it because he won’t stop talking about it. Also, it’s not wise in any capacity to be so distracted that you’re unaware of your surroundings. Shaver was white. There is no race card here. You just read Ben Faulding being identified as African American, and took the media’s spin on a 2014 interview and assumed he was playing the race card. Reading comprehension is almost as important as being aware of your surroundings. I think the JTA ruined it by adding the irrelevant part from 2014. This should only be about how the police allegedly treated him. You’re sorry what happened to who? Racism is racism and it’s disgusting!!! I will say it swings both ways in Brooklyn with me (with my lily white skin) going shopping at Barkley center and having sales people with dark skin tones follow me around thinking I would steal something. I do agree it is stupid to walk around with noise canceling ear phones. You do need to be aware of what is going on around you at all times – it’s golus!!!! But for the police to think a guy jamming to tunes looking at a bottle of conditioner was an armed robber????? Something is so wrong there. Yeah the whole story doesn’t add up. If he isn’t defined by his race, as he claims, then why does the word “shvartze” bother him. Seems like he wants to be a victim. There’s clearly ALOT more to this story. It was a black store clerk who called 911 saying it was an armed robbery. Maybe anti-Semitism…. Antisemitism? How could they possibly have known he’s Jewish? What exactly makes him a chossid? The beard? He’s actually a Rebbe – the Hipster Rebbe. His chassidim would be called Hipsterers. A bad bobe maise.It is a mitzva to tell motzei shabbos mases but about tzadikim. Something tells me this is like 5% true 10% max. I don’t know… seems to me like he heard the store clerk addressing him and purposely ignored her not feeling any need to answer her questions. (A feeling of ‘I’m not doing anything, she’s just picking on me because I’m black’) Also who takes 10 minutes to pick out conditioner? Is this the same guy who calls himself Pop Chossid? Why because they’re both black? I don’t believe a word of this guy’s story. Shame on all you naysayers, shame on you! What gives you the right to question a his chassidishkeit? Who died and made you Rebbe? What gives your the right to question any of his being a mekushar? And while on the question of rights, doesn’t a person deserve to tell his story without being vilified as a person? You want to question his story, go right ahead, but the vitriol is endemic of exactly what he is pointing out to be the problem! Remember, first they came for the industrialists, then for the trade unionists, and when they came for me there was no one left to speak out. Is this the same guy that claimed multiple jewish kids being mugged is just a statistical anomaly? Seems to suddenly be singing a different tune! it’s not his fault, guy just complained about being mistreated by the police in long island and this slimy JTA ‘news’ outfit used is as an excuse board to diatribe about Crown Heights Brooklyn so called racist problem. It’s not his fault, it’s just migagalim zchus al yidei..
BTW you (he) vilified himself. It’s what professional victims do. In a recent article you wrote about accusations leveled upon Rubashkin, some of which he was acquitted of in a court of law. Yet you listed them in your article as if they were facts. So now that you’ve experienced what it’s like to be accused of a crime you did not commit, how would you feel if someone wrote about you “Ben has been accused of shoplifting” without writing the rest of the story? “The one unexpected—and, at least for me, potentially hopeful—consequence of Rubashkin’s near-decade-long ordeal is the effect it’s had on Chabad: For many Lubavitchers, his case opened their eyes to the mistakes and even savagery of the U.S. Criminal Justice system. 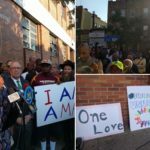 Despite conservative leanings, many in Crown Heights are now extremely concious that the system can be obscenely racist. I can only hope that they contribute to a movement that would see others—including others not like them—emancipated from the tyranny of false or excessive imprisonment. The word shvartze means black. There is nothing wrong in English with referring to “Blacks”. There equally is nothing wrong in Yiddish to refer to people as “Shvartzes”. If you have a problem with the word Shvartze, see a therapist – but leave me alone. Y’all are a bunch racists who dont even realize how racist you are. Ben Faulding is a man that has called out this community for it’s BS and all of you are too blind to acknowledge this truth. Instead, 90% resort to calling him a liar with zero basis for the accusation. Keep up the good work buddy! Some people in this community do stand behind you! This sounds like Ben. Keep chirping, buddy. Nope not Ben, although Ben is a friend of mine. Clearly the whole comment flew right over your empty brain case as you immediately resorted to stating that this was Ben instead of actually thinking about the comment. Shame you went to college and it didn’t even help you be a mentch! And you can’t figure %s accurately either. But that’s ok. You just called ALL of us a bunch of racists, including the 10% who supported this guy!?! No, you’re wrong. I thought about you’re comment and concluded that whoever wrote it seems: angry, bitter, paranoid, disenfranchised and self-victimized. So congrats on sounding exactly like Ben. Boruch Hashem. It seems the officers had good training. Something must have been misunderstood by 911 if 911 thought a shoplifting was a robbery. Everything is a lesson in serving Hashem. What’s the lesson in this story? Not to vilify a community for a perceived wrong? He doesn’t have typical black features and could easily pass as sephardi. 2014 isn’t so long ago so why is a chosid of our Rebbe bad-mouthing the Rebbe’s entire community as being racist? The whole story sounds really weird to me. 2. He’s not a chossid. It all makes sense when you understand the facts. I cant believe the idiots that write their opinions here. Its hard enough being Jewish and black , let alone a chossid and black. He was targeted because of his color. Where is the basic respect for another Jew?People sound like they they graduated from the Yeshiva for morons. Hashem Yishmor! Your a good guy Ben and don’t forget it. Keep your head high and the ear plugs out!! No, he wasn’t. He was targeted for acting like a fool.